For personal trainer Trevor Pace, the house at 418 Homeplace Drive in Stockbridge was more than just a mansion-style home with a fireplace in the bedroom and a jacuzzi en suite. “It was everything we had dreamt,” says Mr Pace, who moved into the house in 2001 together with his wife, Colleen, and their two children. It was the first place they had called their own. Yet five years later, a French bank bought a financial security that was, in effect, a bet that the Paces would default on their mortgage and be forced to leave their comfortable suburban home. 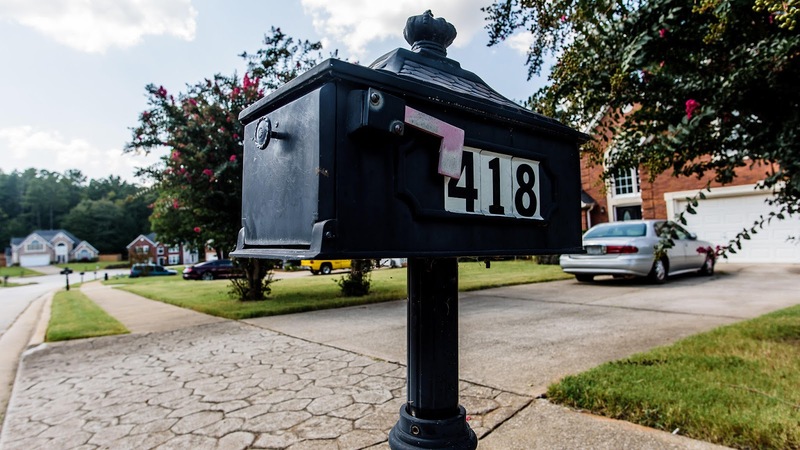 Without Mr Pace or his family realising it, 418 Homeplace Drive had become part of the financial machine created on Wall Street that wrecked the American dream for millions of people and nearly brought down the international economy. Just south of Atlanta, Stockbridge has been touched by other important social changes. More than a century ago, Martin Luther King’s father was born there; by the 1960s, it had become the sort of suburb which closed down its public picnic areas because African-Americans could no longer be barred from entry. During the past two decades, the house on Homeplace Drive has come to represent another period in American history. In the years running up to the financial crisis, it changed from a solid investment to being sliced and diced as part of a security that Wall Street traders sold on to gullible investors all over the world — and which rocked the global economy when it went sour. Since the crisis, it has been on the books of one of the largest private equity groups which have quietly supplanted investment banks as the dominant players in the financial world. In short, the faux mansion is a microcosm of both the recklessness that caused the crisis, and the fragile stability that has followed it. A self-employed fitness instructor, Mr Pace spends every waking hour pumping iron with clients of his “total body transformation service”. “Remember, your body is the greatest creation you will ever have,” a recorded greeting tells callers to his mobile phone. He started the business in 1991 when he returned to Atlanta after a childhood spent on military bases. At the time, the area was undergoing a huge transformation. Every day, 300 new residents moved into the city and its suburbs, and every week, racing to build houses for them, contractors would tear down a patch of woodland the size of 63 baseball fields. 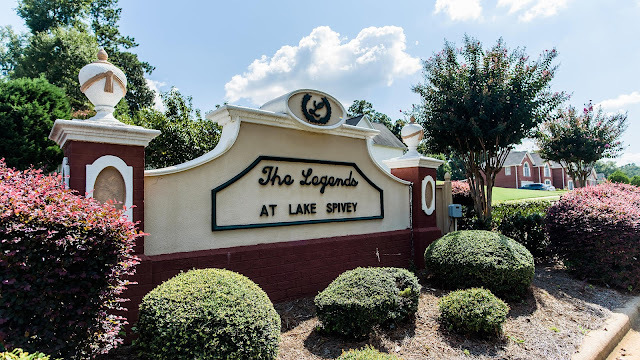 One of those was The Legends at Lake Spivey, a development of 101 homes with identical mock-iron mailboxes organised around forking streets with names such as Timeless Walk, Memory Lane and Homeplace Drive. Vickie Earle was the first buyer of number 418, moving in shortly after it was finished in 1999. There was a communal swimming pool and a clubhouse where the neighbourhood association held occasional ice-cream socials. Ms Earle stayed for two years, before quitting her management job at Delta Air Lines and selling up for about $10,000 more than the $189,900 she paid. She retired to Florida, telling acquaintances she planned to watch the spaceships blast off from Cape Canaveral. 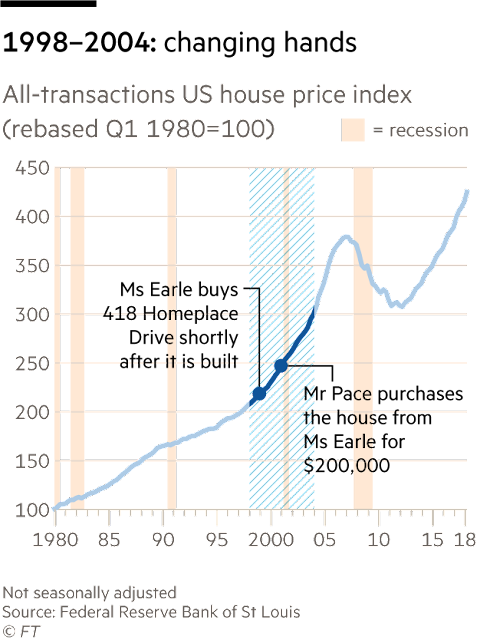 Even with the dotcom bust and the US in recession, house prices were still rising sharply. Part of the reason was a proliferation of mortgages on unheard-of terms, offered to first-time buyers or people who previously struggled to get loans. Among those people was the self-employed Mr Pace, who moved into Ms Earle’s old house by borrowing the entire $200,000 purchase price, according to county records. “My wife had actually found the house,” Mr Pace says, recalling their excitement at moving into the new community. A few years later he and his wife took out an even bigger loan that offered smaller monthly payments over the first few years. And then it all fell apart. In another time and place, the payments on Mr Pace’s mortgage would have been the concern of no one but his bank manager. 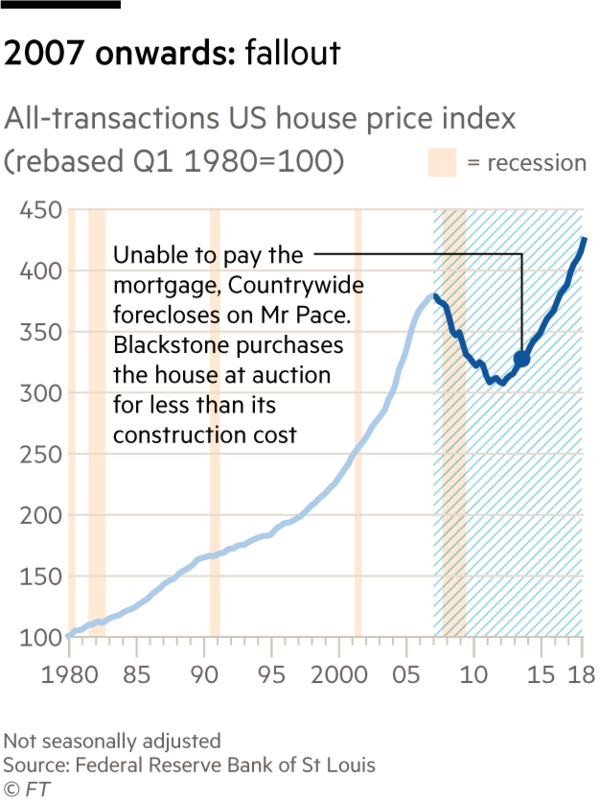 Not so in the globalised financial markets of 2007, where the Paces’ mortgage found its way into Wall Street’s huge securitisation machine. Using mortgage details on Bloomberg that match a deed signed by the Paces and lodged in a Georgia courthouse, it is possible to follow a mortgage (apparently theirs) through the financial system. That loan, dated June 2005, was $14,000 larger than the one they took out when they first moved in four years earlier, although Mr Pace does not remember receiving any money from the refinancing. It was a variable-rate mortgage, with a promotional rate and no repayments of principal for the first three years. Others who were involved in this trade described it more bluntly. “You had no incentive whatsoever to be concerned about the quality of the loan, whether it was suitable for the borrower or whether the loan performed,” says Christopher Cruise, whose courses in mortgage origination were attended by 10,000 salespeople a year. If Your-Best-Rate did not have to worry too much about whether the Paces would be able to pay back their loan, neither did Countrywide. It piled up thousands of mortgages — many of which, it conceded, were “credit blemished” — and sold them in bulk. The Paces were among 10,507 borrowers whose home loans Countrywide packed into a set of securities called the CWABS Asset-Backed Certificates Trust 2005-11. The quality of the borrowers did not have to be high. Homebuyers could qualify if they had been out of Chapter 7 bankruptcy proceedings for “at least one day”. While many of the borrowers had questionable personal credit ratings, the CWABS Asset-Backed Certificates Trust 2005-11 were deemed much safer credits. Even the most junior bonds, which would be hit first by any defaults and paid interest at 1.8 per cent over the Libor interbank lending rate, received an investment-grade rating. More than half the bonds were triple A, the same as the US government. The most senior paid a premium of just 0.16 per cent over Libor. 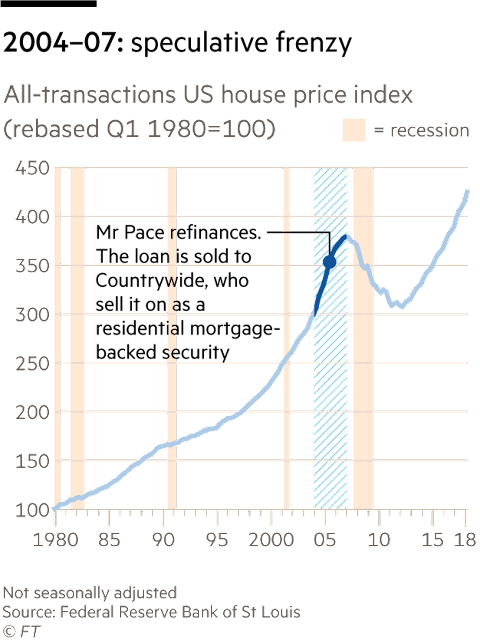 The assumptions about the US housing market that underpinned this premium rating unravelled quickly in 2007, as Americans began defaulting in unprecedented numbers. That sent the price of mortgage bonds such as CWABS 2005-11 into freefall, and it meant no one wanted to buy any more loans from mortgage originators. Your-Best-Rate gave up on writing its own mortgages; in 2010 the company folded. Mr Pace now faced sharply higher payments as his introductory deal expired. “It just turned out that every place we went trying to refinance, they said it can’t be done,” he says. In August 2008, the monthly instalments recorded by Bloomberg shot up from just over $1,200 to nearly $1,900. The Paces never made the payment. Countrywide, still responsible for collecting payments even though it had sold almost all the debt, agreed to add the arrears on to the end of the loan, but it did no good. In January, they stopped the payments, again, this time forever. A decade of post-crisis litigation has provided at least a partial picture of what happened to many of the players in the chain that extended out from Mr Pace through the global financial system. Pension funds in California, Maine, Nevada, Vermont and Washington state all sued the new owner of Countrywide, claiming that many of the sales documents for its securitisation deals were insufficiently forthcoming about the risks. Another suit, filed by 22 large bond investors including BlackRock and MetLife, claimed Countrywide loans failed to meet underwriting guidelines. Bank of America, which bought Countrywide in January 2008 for $4bn, has paid more than $20bn to settle these and other Countrywide-related cases. But the losses on the mortgage-backed securities issued by Countrywide were only a part of the story. In 2006, an affiliate of Goldman Sachs bought more than $2bn-worth of bonds — many backed by subprime or “mid-prime” mortgages. Among them were hundreds of millions of dollars’ worth of loans issued by Countrywide, including the one taken out by the Paces. Goldman packaged them into a “collateralised debt obligation” called Davis Square VI. The securities Goldman bought were among the first in line to bear losses if the underlying mortgages went into default; only 4 per cent of them had received the highest triple A rating from the credit agencies, according to a pitchbook issued by Goldman before the securities were issued. Yet through the same magic of bundling them together and promising that only the most junior investors would shoulder the early losses, the rating agencies slapped triple A labels on more than 91 per cent of the Davis Square certificates, according to the documents. 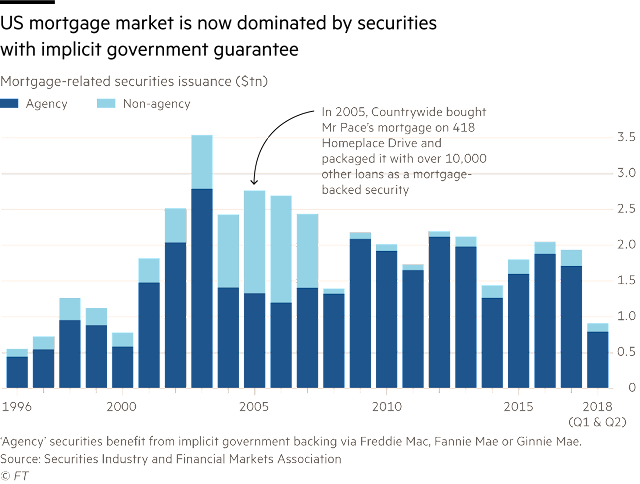 As Mr Pace and millions of other Americans stopped paying their mortgages, the consequences cascaded through Countrywide mortgage-backed securities and into vehicles including Davis Square. The losses stretched far beyond America. Landesbank Baden-Württemberg, a Stuttgart-based savings bank, complained in a lawsuit against Goldman that it lost $37m. Scores of other European banks were burnt by similar investments. But there was another side to CDOs. 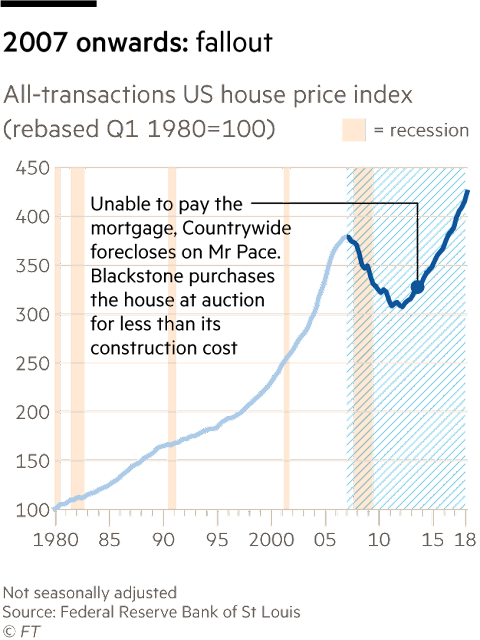 Sophisticated investors, spotting the cracks in the US housing market, were looking for ways to profit from a collapse. Société Générale, the French bank, was one of those that took out insurance against a collapse in the value of Davis Square, buying exotic derivatives contracts from the insurance group AIG. These contracts were, in essence, a way of betting that many homeowners would default on their mortgages. Goldman itself bought similar protection on other CDOs it had sold. Hedge funds could short the housing market by buying insurance against losses on mortgage bonds they did not own. 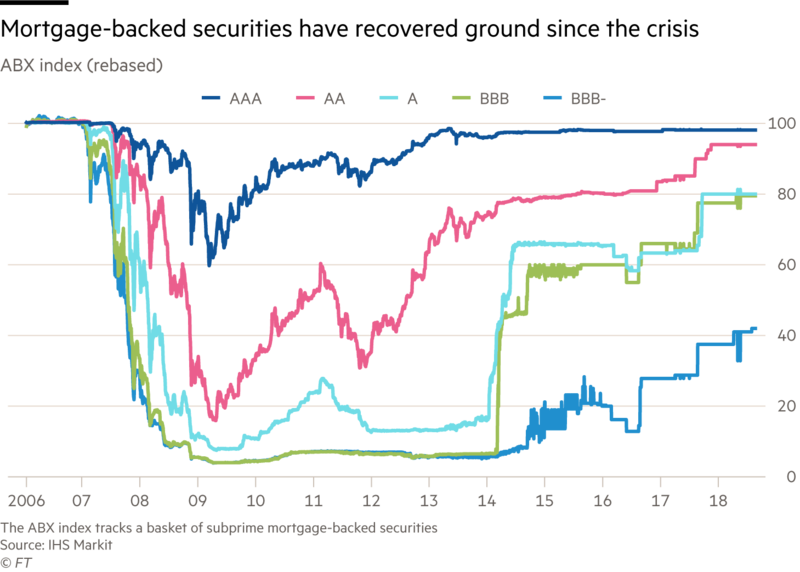 Owing more and more money on these credit default swaps, AIG was forced to accept a US government bailout and taxpayers’ money immediately flowed through to the banks. LBW accused Goldman of malfeasance over the creation of Davis Square, but a court threw out the claim. 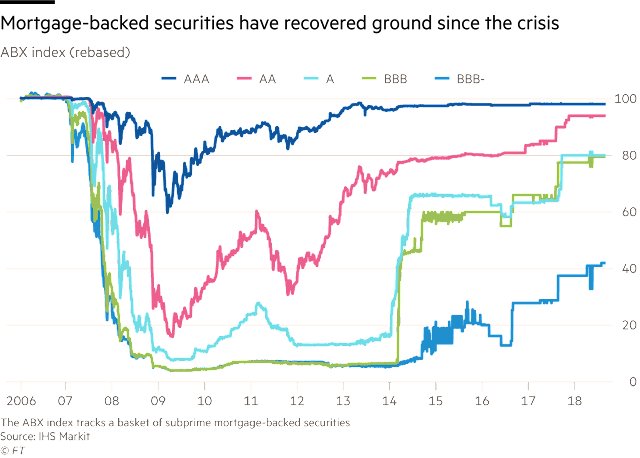 SocGen says that rather than betting against the mortgage market, it bought insurance on mortgage bonds it already owned and took no “view one way or another” whether any particular mortgage performed or not. Goldman has said it suffered losses on subprime mortgages overall and also used credit insurance to hedge its risk, not to bet against its clients. The Paces clung on at 418 Homeplace Drive for years, twice filing for bankruptcy, which forestalled the mortgage company’s effort to take over their house. Eventually, in November 2013, they succumbed, joining a wave of foreclosures that has seen 7.8m families thrown out of their homes since the beginning of the financial crisis. Their home was sold at auction on the courthouse steps — but the new owner was not a young family like the Paces, nor a baby boomer like Ms Earle. It was an investment fund run by a billionaire financier, for whom the great dislocation would turn out to spell a great opportunity. Mr Schwarzman’s private equity firm, Blackstone, already controlled companies that employed 520,000 people and had combined revenues of $94bn, but in the bombed-out house prices of 2008, it saw a chance to do something new and ambitious. 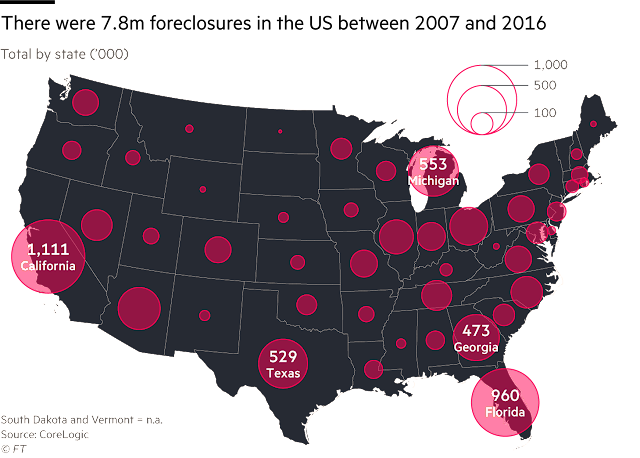 Since the crisis Blackstone has marched into markets that others have been forced to vacate. Its credit arm finances businesses that would once have borrowed from Wall Street banks. 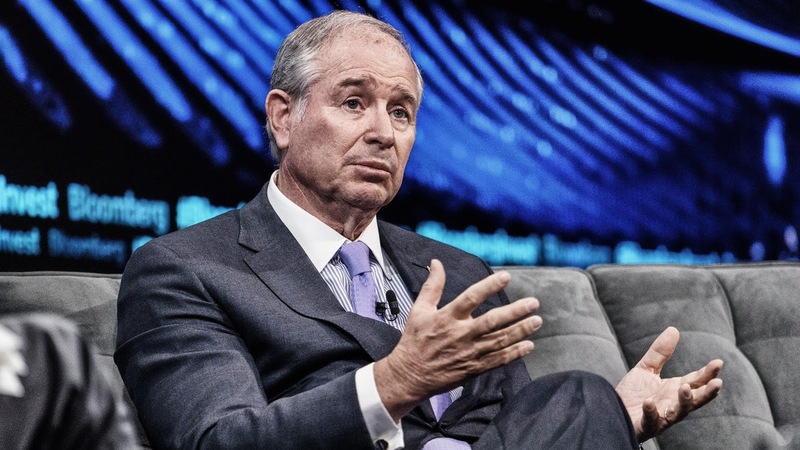 But nothing underscores Mr Schwarzman’s rise more clearly than the portfolio of more than 80,000 single-family homes that have made his firm one of America’s biggest private landlords. With so many people unable to get on the property ladder, Blackstone reckoned the rental market would be highly lucrative. 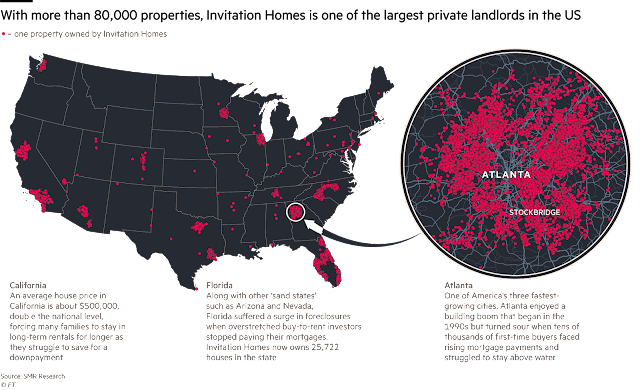 Beginning in 2012, the firm dispatched representatives to buy houses in fast-growing metropolitan areas across the nation, including southern California, Chicago and Atlanta. About one-third of the properties were bought in foreclosure auctions, typically without anyone even inspecting them first. The result of that effort is a company called Invitation Homes that floated on the stock market last year. 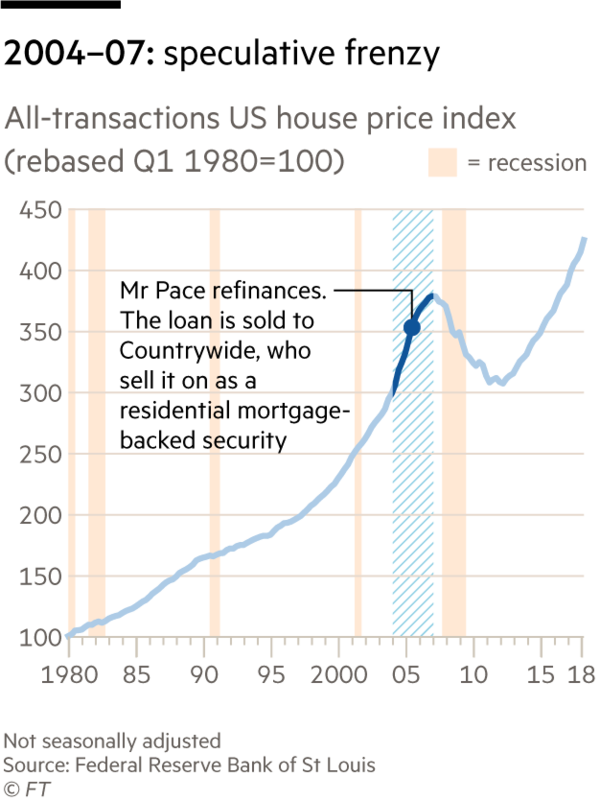 Today it is worth $21.6bn including debt, buoyed by a 35 per cent increase in US house prices since the start of 2013 and an unyielding approach that few private landlords can match. The tenants at 418 Homeplace Drive did not reply to phone calls or letters, however Invitation Homes says it spent about $26,000 renovating the property; a similar four-bedroom home nearby can be rented for $1,600 a month. Invitation owns 12,000 homes in Atlanta alone. “We’ve bought homes in the subdivisions that provided solid, safe neighbourhoods….that would be attractive to families who want to live in and rent these homes for the long haul,” says Charles Young, chief operating officer of Invitation Homes. When Blackstone took over the keys to his dream house, Mr Pace began staying with a nearby friend, hoping his children would not have to change school. He says he has yet to recover from the five-year hustle that ultimately failed to keep him in his home. A decade after 1929, the world had not emerged fully from the Great Depression; unemployment, while down from a peak of 25%, was still 17%. The Dow Jones Industrial Average was triple its low of 1932, but was about half of its peak and wouldn’t reclaim its 1929 levels for a quarter-century. Now, unemployment has fallen from double digitsto under 4%, the stock market has more than recovered its bear market losses, and while the world isn’t exactly at peace, neither is it at outright war. 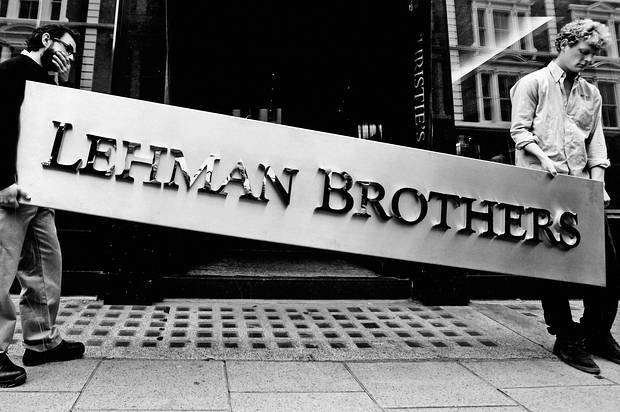 Yet, with the approach of the 10th anniversary of the failure of Lehman Brothers and the near-meltdown of the world’s financial system, the memory is still raw. Rather than being confident, or even complacent, many top investment minds are more consumed by what could cause the next crisis. “This time is different” is often the most dangerous phrase heard at the peak of bull markets, but to Felix Zulauf, the longtime member of the Barron’s Roundtable and head of Zulauf Asset Management in Baar, Switzerland, every crisis is different from the previous one. “Different” certainly describes U.S. politics, but the drama in D.C. that dominates the news these days isn’t what concerns the markets. Neither do the escalating tensions over trade and tariffs, at least not yet. The widespread presumption is that the U.S. and its major trading partners, especially China, won’t allow the disputes to escalate to a full-scale trade war, as in the Great Depression. What the markets fret about most is the withdrawal of the unprecedented medicine provided by central banks in the form of trillions of dollars’ worth of liquidity, which has inflated asset values and spurred the long but slow recovery of major economies. Indeed, after initially failing to either appreciate the approaching crisis in 2007-08 or respond adequately, policy makers seemed to learn from the 1930s; they tried to do the opposite of what policy makers did back then. Most specifically, by adopting quantitative easing—enormous central bank purchases of securities with money created out of thin air—the Federal Reserve, the European Central Bank, and the Bank of Japan, plus other major central banks, avoided what economists Milton Friedman and Anna J. Schwartz deemed the key policy blunder of the Great Depression of letting the money supply contract. QE has worked, insofar as financial assets are concerned. 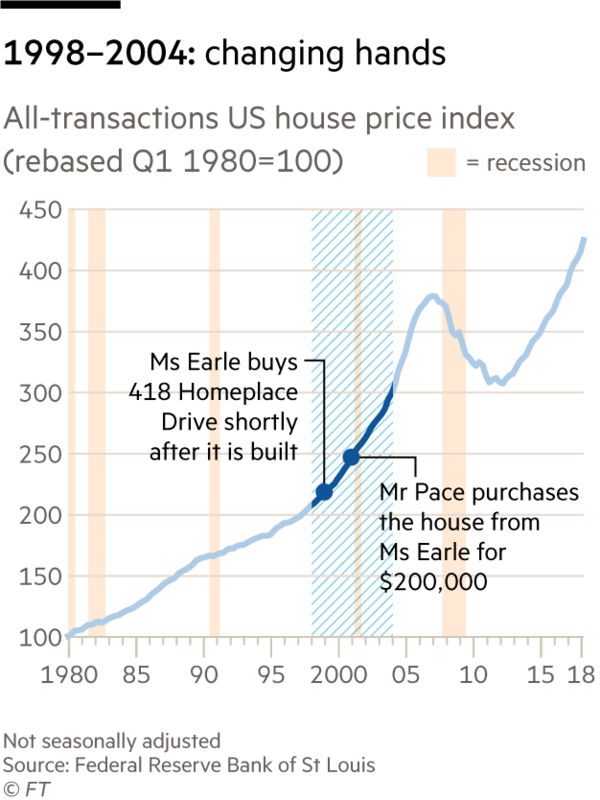 As then–Fed Chairman Ben Bernanke explained after the central bank instituted the second phase of its securities purchases, QE was supposed to lower interest rates on mortgages and corporate bonds to spur housing and capital investment. That would encourage higher stock prices, which would boost consumers’ wealth and confidence, and thus spur spending, and in turn incomes and profits. Of all those aims, the Fed has hit its target most squarely in the stock market. According to Wilshire Associates, U.S. equity values have increased by $27.8 trillion, or 337%, since the stock market’s low in March 2009, which came within days of the Fed’s stepped-up QE. According to Yardeni Research, a chart of the rise in the combined balance sheets of the Fed, ECB, and BOJ, from roughly $4 trillion in 2008 to a peak of $15 trillion in early 2018, was closely paralleled by the rise in the S&P 500. That’s now changing. Since last October, the Fed has proceeded as promised in shrinking its balance sheet, reducing its assets by $252 billion. And as Peter Boockvar, chief investment officer at Bleakley Advisory Group, points out, the net purchases of the Fed, ECB, and BOJ will go from the equivalent of $100 billion a month in the fourth quarter of 2017 to zero starting in this year’s fourth quarter. The strains are beginning to be felt in the weakest links of the global financial system: the emerging markets, primarily Turkey, Argentina, and South Africa. Other points of strain are also appearing overseas, notably in Italy, says Mark J. Grant, chief global strategist at B. Riley FBR, who warned early on of Greece’s debt crisis. The budget from Italy’s coalition of far right and populist parties is due later this month, “and I think that is when the fireworks begin,” he says, possibly putting the entire European Union in jeopardy. Then there is the omnipresent concern over China’s opaque and highly indebted financial system. But the real bubble inflated by the central banks has been in supposedly safe government and corporate bonds, Boockvar of the Bleakley Advisory Group contends. The damage will become apparent in the next 12 to 24 months as they move from QE to QT, or quantitative tightening. That, in turn, will damage an overly indebted world economy. The bond bubble has helped to inflate the stock market, writes former Dallas Fed advisor Danielle DiMartino Booth in her Money Strong weekly note. In the last five years, U.S. corporations have taken advantage of low yields to sell $9.2 trillion of bonds, which have helped fund $3.5 trillion in repurchases, and are on pace for a record $850 billion in stock buybacks in 2018. Jason DeSena Trennert, who heads Strategas Research Partners, points to private equity as the sector that has been inflated the most. Public retirement funds’ average assumed return is 7.6%, far above what a balanced portfolio of bonds and stocks is likely to provide, so these funds and endowments have flocked to PE to try to reach that probably unattainable bogey. As a result, there are billions of dollars looking for the next Uber or Slack. Pensions are at the top of the worry list of Stephanie Pomboy, who heads MacroMavens and was farsighted in seeing housing triggering the last crisis. The $4 trillion in unfunded public pension liabilities dwarfs the $500 billion in underwater housing that helped set off the great financial crisis. A hit to risk assets would only deepen the pensions’ hole, and could necessitate a bailout that could make QE “look like rounding error,” she says. “When the repricing begins, the rise of ‘quants,’ as well as passive strategies and ETF vehicles, will amplify the downturn many times over,” she adds. That view was echoed last week by JPMorgan quantitative strategist Marko Kolanovic. “The shift from active to passive management, and specifically the decline of active value investors, reduces the ability of the market to prevent and recover from large drawdowns,” he writes in a research report. That was the result of some $2 trillion of assets shifting from active and value strategies to passive and momentum-following strategies. The aforementioned shift to such nonpublic assets as PE, real estate, and illiquid credit instruments further reduces the pool of cash available to the public markets, he adds. The result, Kolanovic writes, could include the rise in populism, protectionism, and trade wars, whose market impacts may simply be delayed. Ultimately, “the next crisis is also likely to result in social tensions similar to those witnessed 50 years ago in 1968.” In the subsequent decade, the global financial order broke down, inflation soared, and stocks produced zero returns. Fed Chairman Jerome Powell pointed out recently that the last two recessions followed financial market excesses rather than inflation, which in previous cycles led to Fed tightening and then economic downturns. Does that mean he will continue the steady-as-she-goes normalization of the Fed’s balance sheet and its interest rates, even if it means some deflation of asset prices? Or does Powell dare not risk a decline in asset prices? BofA ML’s Hartnett writes, “Wall Street deflation, rather than Main Street inflation, is the quickest route to recession (see Japan, Europe, China).” An economic downturn could have further-reaching political and social impacts, as Kolanovic suggests. The Fed’s balance sheet shrinkage could end because of a growing global crisis, or the U.S. economy slows and inflation fears abate, Zulauf concludes. At that point, he says, asset prices could be quite a bit lower. “And then one needs cash to benefit and buy whatever you like cheaper,” he concludes. That’s the good side of a crisis, for those who come through it. 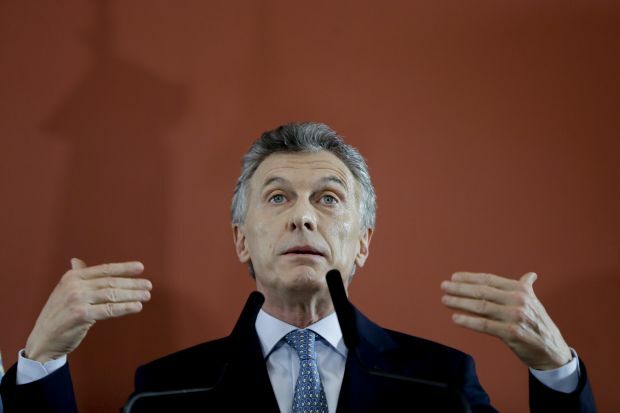 Faced with a currency crisis, Argentine President Mauricio Macri’s first instinct was to call the International Monetary Fund. The conditions of the bailout deal, however, risk prolonging the IMF’s dubious track record when it comes to helping emerging economies. The agreement reached last week between Argentina and the IMF brought the total bailout package to $57.1 billion through 2021. The cash injection is good news in the short term because Argentina’s government has a lot of U.S. dollar-denominated debt to service and the peso is down more than 50% against the greenback this year. But it seems unlikely that the conditions imposed by the IMF will ensure the robust economic recovery many international investors are hoping for. First, the IMF will only allow the Argentine central bank to shore up the peso if it falls beyond a certain level, and only by spending a maximum of $150 million dollars. If investors are intent on selling, that quantity may be little more than a water gun. Second, to fix its inflation problem, the central bank will be forced to keep the amount of money it issues unchanged—it’s now growing at a 24% annual pace—and the government will need to massively slash its budget deficit. This cocktail of policies echoes back to the 1970s, when limiting the amount of money central banks could print became all the rage. The approach proved unworkable and was soon abandoned. Many of the countries the IMF helped back then weren’t doing any better by the 1990s. For countries like Argentina, the key determinant of inflation isn’t the amount of money in the economy, government spending or even central-bank policy. Instead, they are at the mercy of global capital flows. When the Federal Reserve raises rates and investors flock to the dollar, emerging-market currencies plummet and import prices surge. Workers and companies respond by trying to set wages and prices higher. Argentina is particularly prone to this problem because of its strong unions and dollarized utility prices. 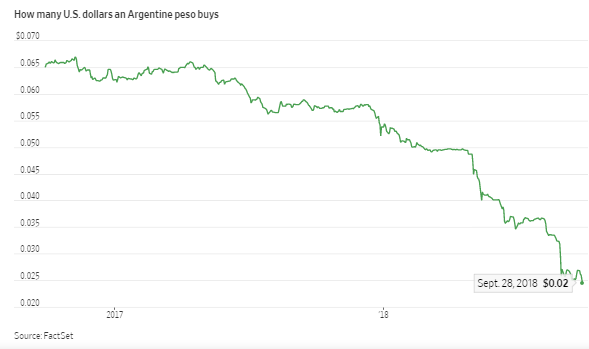 Fixing Argentina’s economy may require painful measures, such as freezing public-sector wages, tempering union power and putting up with lower corporate profit margins. The government should also limit dollar debts. In the longer term, elements of China’s development success might offer a roadmap: Exchange rate stability, coordinated policy on incomes and a focus on producing exports in scale industries. Targeting deficits and arcane monetary targets could indirectly achieve some of these goals, but it could also do a lot of damage. Rehashing the 1970s doesn’t look a useful path forward for Argentina. Investors should stay away. The U.S. has expressed concern about these missiles before, but this is the first time it has threatened to destroy them. It’s unclear what a pre-emptive strike would involve, but it’s safe to assume Russia would consider it an act of provocation and could escalate conflict accordingly. Our initial reaction is that it is a test of NATO. Most of the U.S. comments appear to be directed not at Russia but at its European allies, many of which, Washington believes, have been overly permissive about Russian missiles. If NATO is content to allow what the U.S. claims are violations of a Russian treaty commitment, then it says a lot about NATO. The U.S. has made military action contingent on the failure of the diplomatic route. And here, the U.S. expects the Europeans to take the lead. In a sense, the U.S. is trying to force Europe to take this seriously. And it’s reminding its allies that it won’t shrink from unilateral action, however unlikely the prospect may be. Russia’s intentions are difficult to parse. The threat posed by these missiles does change the balance of power in Europe somewhat. Russia seemed to think that apart from the expected rhetoric from the U.S., and absent anachronized notions of nuclear deterrence, nothing would happen. From the American point of view, a treaty violation is significant. But the incident raises perhaps an even more important question: If the Russians see the nuclear balance as archaic and threats to Europe as outmoded, then why is it deploying this missile? The development of the missile likely indicates that the Russians do not see this as archaic. For the U.S., threatening to strike the Russian sites is meant to galvanize the Europeans and drive home the fact that in geopolitics, nothing is archaic. WASHINGTON—The Federal Reserve could broaden the number of banks receiving regulatory relief from Trump-appointed officials under an initiative that changes how it defines a big bank. As part of a series of rule changes still under development, the Fed is preparing to revise asset-size and other thresholds in its capital and liquidity rules, according to people familiar with the matter. The changes could lead to lower regulatory costs for some large U.S. banks, including Capital One Financial Corp., PNC Financial Services Group Inc.and U.S. Bancorp. It is less clear the changes will help gigantic firms the Fed considers “systemically important” to the global financial system, such as Citigroup Inc.and Goldman Sachs Group Inc.
Likely candidates for the rule changes include the liquidity coverage ratio, which requires banks to hold assets they can easily convert to cash in a pinch, and “advanced approaches” rules, one of several capital regulations that limit banks’ borrowing. Fed Vice Chairman for Supervision Randal Quarles, who is set to testify before the Senate Banking Committee on Tuesday, has previously said those rules are worth revisiting. “It is clear that there is more that can and should be done to align the nature of our regulations with the nature of the firms being regulated,” Mr. Quarles said in testimony prepared for the hearing. The potential changes were discussed at a recent meeting between top officials at the Fed and the two other primary U.S. bank regulators, the Office of the Comptroller of the Currency and Federal Deposit Insurance Corp., one of the people familiar with the matter said—a sign the Fed is beginning to turn Mr. Quarles’s ideas into formal proposals. But it isn’t clear when the Fed will formally propose the changes. The regulator has a crowded agenda and some of the changes may also need the approval of other financial regulators. The changes are part of the Trump administration’s broader push to revisit bank rules it believes are overreaching. Other parts of that effort include a proposed rewrite in May of the Volcker rule trading restrictions and an April proposal to alter a big bank capital rule known as the leverage ratio. Another motivator: This summer, Congress passed bipartisan legislation amending the 2010 Dodd-Frank financial regulatory law to say that the Fed “shall … differentiate among companies on an individual basis” when applying its most stringent bank rules, even if a bank is very large. Dodd-Frank had said “may” instead of “shall.” The change gives the Fed an impetus to grant banks regulatory relief. The new law separately allows the Fed to exempt banks with fewer than $250 billion in assets from some tough rules, including annual stress tests—a change from the previous level of $50 billion. It tells the Fed to take into account banks’ size as well as other “risk-related” factors. In several of its rules, the Fed defines a big bank as holding more than $250 billion in total assets or more than $10 billion in foreign exposures on its balance sheet. Mr. Quarles has pointed out these thresholds were developed more than 10 years ago. One key regulation that relies on those thresholds is the liquidity coverage ratio, which was adopted after the 2008 crisis. It requires banks to hold enough cash or easy-to-sell assets to cover a month’s worth of liabilities. The idea is to prevent a repeat of 2008, when even strong banks faced collapse because they were too reliant on volatile, short-term funding. The liquidity rule applies equally to all banks that trip either threshold of $250 billion in assets or $10 billion in foreign exposures. Regional banks have argued the rule is unfair because it puts them in the same bucket as global banking behemoths. Capital One, PNC and U.S. Bank have more than $250 billion in assets but are less one-fifth the size of JPMorgan Chase& Co., the largest U.S. bank by assets. American Express Co.is smaller, but has to follow the Fed’s toughest liquidity rule because of the foreign-exposure threshold. A firm following a looser liquidity rule could have more freedom to jettison Treasury bonds or other safe assets and boost riskier, more profitable activities such as loans. Such a change could also affect the pricing or availability of deposits, since the rules effectively tax deposits that regulators judge likely to leave the bank in a crisis. The Fed also uses the $250 billion-asset and $10 billion foreign exposure thresholds in so-called advanced approaches capital rules. These rules predate the financial crisis, and involve calculating a bank’s capital position using complex and expensive mathematical models. A Fed rule change could reduce the cost of running the models, although it may not lower the bank’s overall capital requirement as long as other capital rules remain in effect. Wharton's Mauro Guillen and Fordham's Matt Gold discuss the Trump administration's efforts to renegotiate NAFTA. In its bid to recast NAFTA (the North American Free Trade Agreement), the U.S. secured the buy-in of Mexico last week, but it still faces resistance from Canada, the treaty’s third partner. The U.S. doesn’t have any leverage in its discussions with Canada, and some of its proposals could end up costing consumers more, according to Wharton management professor Mauro Guillen and Fordham University adjunct law professor Matt Gold. The U.S. posture in the discussions could also erode its image as a champion of free trade, and protectionist policies would come back to haunt it, they warned. Last week, when the U.S. announced its deal with Mexico, the country braced itself for a recalcitrant Canada. The U.S. Trade Representative stated on August 31 that U.S. President Donald Trump has notified Congress of his intent to sign a new trade deal “with Mexico — and Canada, if it is willing,” in the next three months. Contrary to the impression the administration has conveyed, Gold noted that the agreements relating to the digital economy and agriculture are not exactly concessions that the U.S. has extracted from Canada or Mexico. “Those are things that all three countries wanted to update, to benefit them mutually,” he explained. The major gain for the U.S. in the renegotiated agreement with Mexico is a change in the rules of origin for automotive products favoring American content, he noted. Under the deal with Mexico, 75% of auto content will be made in the U.S. and Mexico (up from 62.5% earlier), and 40% to 45% of auto content will be made by workers earning at least $16 an hour. Those two measures are aimed at encouraging U.S. manufacturing and regional economic growth, and driving higher wages for U.S. workers. The two countries have also reached an agreement covering protection of intellectual property rights, digital trade, financial services, and labor and environmental obligations. A related agreement covers agricultural trade between the two countries, and its highlight is the retention of zero tariffs. The countries would revisit the deal after six years. Trump had earlier asked for a sunset clause where the agreement ceases to exist after five years unless the countries renew it. One sticking point with Canada is the U.S. demand to remove NAFTA’s Chapter 19, which allows for a dispute resolution mechanism where actions by either of the participating countries could be challenged by independent panels. Another source of contention is Canadian tariffs on U.S. poultry eggs and traditional dairy products. As it happens, fears of higher prices have already led to a spurt in auto sales. Ford Motors last week announced a 20.6% increase in SUV sales with more than 72,000 vehicles sold in August 2018. “The surge in sales has a lot to do with buyers being concerned that the prices of cars and light trucks are going to go up significantly — the president has been threatening to impose new national security tariffs on those,” said Gold. Trump has threatened to impose 25% tariffs on car imports into the U.S. from Canada if the two countries cannot agree on concessions on dairy supply management and removal of Chapter 19 from the treaty. What really ails NAFTA now, and how can it be fixed? Gold said over its 24 years, the agreement has been updated several times to incorporate changes in the broader environment such as the advent of digital commerce, wireless calling, inspection rules for animal products, plant products and grain, and so forth. However, the Trans-Pacific Partnership (TPP) would have provided the U.S. a bigger say, according to Gold. The 12-nation TPP would have included Canada and Mexico, and the U.S. could have said that it no longer needed NAFTA for free trade and pulled out of it, he said. But Trump’s decision to pull the U.S. out of the TPP closed that window, he noted.